Patricia Gualinga, Director of International Relations in the Sarayaku community government. Photo courtesy of Patriia Gualinga. Standing before a packed audience of 2,000 spectators, Patricia Gualinga Montalvo calmly addressed the crowd, sharing the story of her people. The Sarayaku, a Kichwa indigenous people numbering 1,200 from the Ecuadorian Amazon, won a historic court case in 2012. 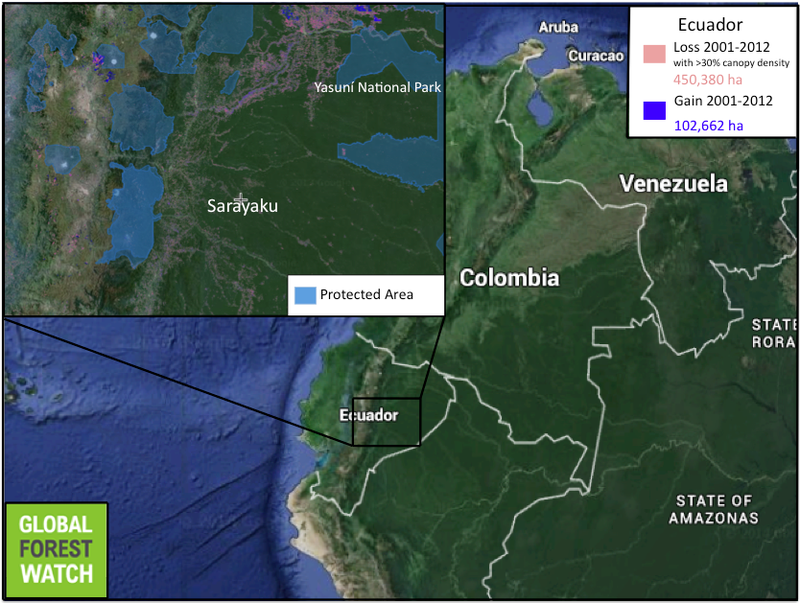 The Inter-American Court of Human Rights ruled that the government of Ecuador must publicly apologize, consult with, and recompense the Sarayaku for allowing oil exploration by Argentine Compañia General de Combustibles on their territory without prior consultation. Gualinga was speaking at the 25th annual Bioneers conference at the Marin Center in San Rafael, California, far from her homeland just south of the equator. Bioneers, founded by Kenny Ausubel and Nina Simons in 1990, arose from their interest in Biological and Cultural diversity, biomimicry (production and design based on biological entities and processes), and natural medicines. The first conference took place in Santa Fe, New Mexico and was attended by about 250 people. While the initial conference focused on seed diversity, ecoagriculture, cultural diversity in Latin America, bioremediation, and progressive politics, the most recent incarnation spans topics as diverse as sustainability education, resilience, new media, women and indigenous rights, reforestation, and meditational practice. The event included talks from over a hundred experts, such as Naomi Klein, author of This Changes Everything: Capitalism vs. the Climate, Paul Stamets, world-renowned mycologist, who revealed his recent research on the role of mushrooms in keeping honeybees free of parasites, and Thomas Clayton-Muller, indigenous activist and organizer for the Idle No More campaign. Prominently featured among these speakers were indigenous leaders from across the world, reflecting a growing acknowledgement of the importance of traditional knowledge and ceremony among conference members. Gualinga recounted the powerful struggle of her people. The Sarayaku consist of seven communities along the Rio Bobonaza, a tributary to the Amazon, and are governed not by the federal government of Ecuador, but by their own indigenous government. 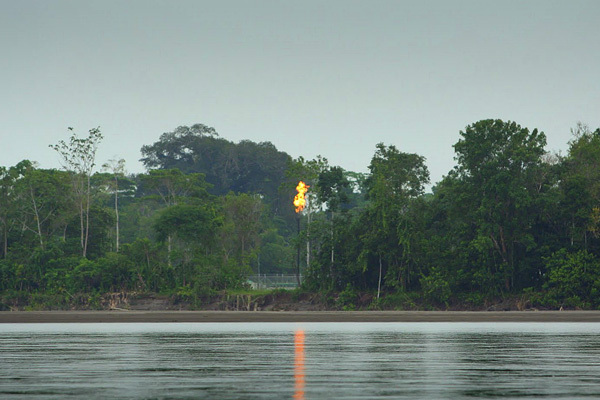 Gas flaring just across the river from Yasuni National Park, near Sarayaku territory. Photo by Jeremy Hance. The Sarayaku’s ancestral territory is in a remote area of eastern Ecuador’s Amazon, south of the controversial Yasuní park. Around the year 2000, an oil company came and began exploratory drilling for oil. For months, engineers detonated explosives, cut trees and dug wells, protected by Ecuadorian soldiers. The Sarayaku raised complaints and reached out to international allies, applying enough pressure to force the company to abandon their project. Gualinga served her community in the midst of this fray for decades, initially as an advisor to the leaders of the Sarayaku indigenous government, and now as Director of International Relations in the community government. Following 12 years of legal dispute, the Inter-American Court of Human Rights finally ruled that Ecuador had breached the Sarayaku’s rights by allowing the oil company to enter without prior consultation, threatening their cultural identity and putting the survival of the community at risk. With the remuneration from the court case, the Sarayaku have created a community airline, consisting of two propeller planes to support their ecotourism business, as well as a community bank and a scholarship fund. 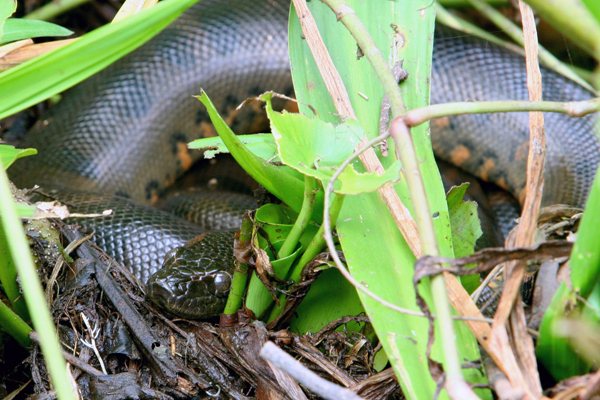 Ecuador is lush with wildlife, such as this juvenile green anaconda (Eunectes murinus). Photo by Jeremy Hance. 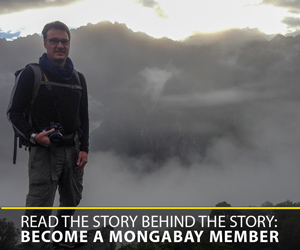 Mongabay: When did you begin to work for your community? Patricia Gualinga: I began working as an advisor to our directors, and then worked as the director of women’s affairs for three and a half years. But really, I have served my people for all of my life, giving advice, support, help, and taking responsibility when our authorities were threatened. Mongabay: How would you describe the Sarayaku indigenous government? Mongabay: What was the greatest challenge you faced in your struggle with the oil company? Patricia Gualinga: The greatest challenge was fighting the transnational companies. Most people said it was a lost battle, that it was a collective suicide. This form of resistance, against the current, is critical. It shows that one can fight, one can be a dignified people, and one must respect the rights of the indigenous. Now we’ve won, but we face a greater challenge. Now we have to demonstrate the sustainable development of our villages. We must disprove the theory of poverty, that claims indigenous people need oil to develop. We want to show that it is not necessary to destroy the environment to justify economic gain. We can construct vital communities, clean, healthy, dignified, and also economically sustainable over time. Sarayaku has been spared large-scale deforestation, as a result of collective action and indigenous resistance. The department of Pastaza, where Sarayaku is located, has 3 million hectares of forest cover, covering nearly the entirety of the department. According to data from Global Forest Watch, 11,178 hectares of forest were lost between 2000 and 2012 in Pastaza, compared with 63,403 hectares of forest loss in Orellana, the neighboring department that contains the controversial Yasuní National Park. Map courtesy of Global Forest Watch. Click to enlarge. Mongabay: How can the Sarayaku maintain their cultural identity in a globalized world? Patricia Gualinga: We cannot be the people we were 150 years ago—all of these processes have changed us. We have our own language, our own festivals, our own clothing, customs, and way of understanding the forest. But we cannot remain isolated—if we had stayed isolated, we would have lost the to the oil company. We use media such as, video, press, and communicate with other networks supporting indigenous and environmental rights. The people of Sarayaku are specialists in trying out other cultures! Learning new dances, trying out rapping, salsa, whatever. Maybe we don’t do it so well, but they sure try! But we are also specialists in returning to the village, and putting on traditional body paint, like jaguars, and dancing, drumming and competing in hunts. Mongabay: What do you think the rest of the world can learn from the struggle of the Sarayaku? Patricia Gualinga: The indigenous people have been told we are poor, dirty, backwards, and that we have to change this. But this is not so, we have to show the world that the indigenous people are dignified, wise and proud. We have values that the other people do not have. We value the forest, and people look to us to protect them. Mongabay: What is your message for people facing environmental repression around the world? Patricia Gualinga: Unify and fight! That little voice of fear in your heart saying, and what will happen to me now, that must be overcome! This is the way to make change. A process of resistance is hard, it is not fun. But it is the only way. And now is the time, the world is starting to have a consciousness. People are realizing we are on a path without a future. We have to find a way forward, not just indigenous peoples, but everyone! (12/04/2014) A new short film documents the journey of an indigenous tribe hiking deep into their territory in the Peruvian Amazon to encounter a mysterious stone countenance that was allegedly carved by ancient peoples. According to Handcrafted Films, which produced the documentary entitled The Reunion, this was the first time the Rostro Harakbut has been filmed. Is the Gran Canal really a ‘big Christmas present’ for Nicaraguans? (12/04/2014) “A big Christmas present”—that is how Paul Oquist, an advisor to Nicaraguan president, Daniel Ortega, described the country’s plan to build a mega-canal across the nation. Preliminary construction on the canal is set to begin December 24th, despite major concerns over environmental destruction, forced removal of thousands of people, and a lack of transparency. (11/26/2014) If you have ever wondered about the connection between hallucinogenic frogs, uncontacted peoples, conservation, and climate change — and who hasn’t? — check out this TED talk from ethnobotanist Mark Plotkin. An ethnobotanist by training, Plotkin serves as President of the Amazon Conservation Team. Plotkin took a few minutes from his busy schedule to answer a few questions from Mongabay. (11/20/2014) Throughout the tropics, staggering amounts of land have been designated for natural resource extraction—as much as 40 percent of Peru, 30 percent of Indonesia and 35 percent of Liberia. However, much of this land is already in use; it is being inhabited by local communities and indigenous peoples. And while it is possible to live on and extract resources from the same land, when local communities are not consulted in this exchange, conflict may erupt. (11/18/2014) On September 1st, indigenous activist, Edwin Chota, and three other indigenous leaders were gunned down and their bodies thrown into rivers. Chota, an internationally-known leader of the Asháninka in Peru, had warned several times that his life was on the line for his vocal stance against the destruction of his peoples’ forests, yet the Peruvian government did nothing to protect him—or others. (11/18/2014) Northeastern India is part of the Eastern Himalaya biodiversity hotspot, one of the megadiverse areas of the world. The region boasts more than 60 percent forest cover, compared to the 15 percent for India as a whole. However, not all is pristine when one visits areas designated as forest on the map. (11/16/2014) In September 2014, events took place in three different parts of the world, which together highlight the multifaceted relationship between human rights and conservation. First, in New York, the UN General Assembly adopted the Outcome Document of the World Conference on Indigenous Peoples. (11/06/2014) In 1925, Nele Kantule led a revolution that would make Guna Yala an independent and sovereign indigenous territory within Panama. Since then, the Guna have maintained a way of life that has allowed them to preserve their natural resources and mainland forest to an exceptional degree. But today, like many indigenous groups around the world, the Guna face some of their greatest challenges yet: the impacts of climate change, encroaching outside influences, and a younger generation that many elders feel is drifting from its roots.